Maybe you've had an emergency come up or you had a necessary but costly procedure, and you're pressed to pay your medical bills. Don't ignore them (trust me, I've seen some horrid credit scores due to unpaid medical bills), but also don't panic. Think strategically about how you can pay off your debts — maybe you can build reward points on a credit card or use a local charity to help pay the bills. If your situation isn't an emergency, make sure you know the full story before going through with a procedure so you're not surprised when the bills start adding up. Don't be surprised months later! Before undergoing a recent procedure, I was told the cost would be $700. Once the procedure was over, the bills started rolling in, and the actual cost was closer to $2,500. When I called to question the amount, the nurse "kindly" explained that I should have already been debriefed on the cost. When I insisted I hadn't been, she said, "Well, that's too bad." Nothing could be done at that point. The procedure was done and the money was owed. And yes, it was too bad. Make sure you know every cost and contest anything you weren't aware of. Nothing worse than having a medical expense toward the end of the year, make a payment plan to pay it off before the end of the following year, and then have your deductible roll back to zero as soon as the new year begins. If you can wait until the beginning of the next calendar year, do so and get the most out of your deductible. One time a doctor wanted to do an "experimental" procedure that was "hard to approve through insurance." I quickly said, "No way!" but he tried to get them to approve it anyway. I got a denial letter in the mail, and the next day I received a call from my doctor's office to schedule the appointment. When I said the insurance company hadn't approved it, they vehemently fought me. The insurance company had approved it, according to their records. I told them I wasn't interested in the procedure and hung up the phone. Once you receive the bill(s) from your healthcare professional, don't panic or get angry. 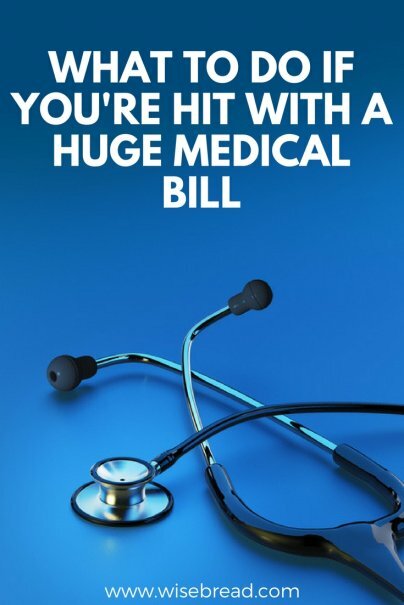 Once you receive your bill, the first thing to do is call your doctor and ask for an itemized list of what was done during a procedure or emergency room visit. When you receive your itemized list, whip out your explanation of benefits and compare and contrast. Sometimes, a nurse can mistakenly code something incorrectly, or other times a hospital can charge you for anesthesiology when you already have to pay an anesthesiologist separately. For clarification, call your insurance company and find out how it was coded. Note that insurance companies usually cover preventative care completely, but not generally follow-ups. Once you suss out the charges, find out if they do payment plans (and more importantly if there are any fees or interest associated with one). Weigh the options — sometimes it's better to pay off the debt, so you don't have to worry about it and then replenish your savings. I've run into some trouble with a medical center that was not properly communicating with their billing department. First, they didn't have a record that I had set up a payment plan, and then they didn't receive my first two payments, although they'd taken the funds out of my account. I've yelled and cried until someone resolved it (not always the best option! ), but the worst part was when the woman told me I should have written down the name of the person who set up the payment plan. Nothing like fighting a lost cause. All this is to say, make sure that every single time you speak to someone, you write down their name, the date and time, and their call back number. Different people give you different answers. After my recent procedure when I received four bills instead of the promised one, and I called regarding each one to set up a payment plan, I was frustrated — most of the places I was going to have to call every single month to give them a credit card number or mail a check. So, I decided to find a credit card with 0% APR, charge it, and reap all the benefits. I searched around, but as an already loyal Bank of America customer I had been bombarded by their cash rewards card offers. I'm not saying this is the best option for you necessarily, so do your homework and read all the fine print. I got a $115 bonus for my purchases; every little bit counts! Just make sure you pay attention to when your 0% APR ends; you don't want to be hit with a major bill later. If there's nowhere to turn, try an organization that can help you in a financial crisis. First of all, read this informative article about how to erase your medical debt. In other words, some hospitals offer the chance to have some or all of your medical bills erased if you make below a certain amount. Otherwise, there are plenty of organizations and charities who can help: the government, Patient Advocate Foundation, HealthWell Foundation, Catholic Charities or Patient Access Network. If you have a particular disease, such as cancer or a chronic disease, there are separate organizations to help you. Search around and you might be able to find some relief. Also, your own hospital might have a charity organization attached to it. It doesn't hurt to ask. After you've come to grips with paying your high medical bills, try to use them to your advantage. Well, your deductible is paid...for this year...so immediately do anything else you've been putting off. If you've had a persistent stomach ache or heartburn, go to a gastroenterologist. If you have a rash, go to a dermatologist. If you need your wisdom teeth pulled (and they haven't been painful, just annoyingly there, like mine), make sure it's covered under medical expenses and get them yanked out! You've paid in quite a bit, so get some return on your investment into your own body. Keep a record of everything you've paid for. If it exceeds 7.5% of your total income, you might be able to deduct it from your taxes. Consult a tax professional on this one, unless you easily understand the IRS website. And if that's the case, please call me; I need some tax advice for medical expenses. How have you managed (or retired!) a large medical debt? Excellent points! I had a large array of lab work that was due in November. Asked my Dr if January 2 was too late, and when they said no, pushed them back and rescheduled my followup. Same thing with ear tube removal surgery for my daughter. She actually met her deductible in January, and may even hit the MOOP (Maximum out of pocket) by June. Time for any dental that may be medical (needs a couple of teeth extracted)! Or you can scrap all the above and live in a decent country that has medical insurance for everyone like England, Canada, or Germany. Then you can tell the USA Doctors to stuff it the thieving bastards. I've got the Doctors office trying to charge me with office visits that never happened, They say its your word against thiers and they send you a bill and tell you if you don't pay it they will turn it over to a colection agancy and ruin your credit. I've got news for them, I have no credit I pay cash for everything, so I don't care, but there are other people out there that do have credit and are in a corner. I've never had a "huge" medical bill but I've had several that were more than I could pay for right away. Each time I called the billing dept. and worked out a payment plan. This might no work if you owe $100,000 or something really big like that. But it's always worth a try. And much better than simply not paying. You ignored the most important step in your plan. Call the biller, explain that you are being hit with a lot of bills - if that's true! - and ask for a discount. Most of them will give a discount of some sort. I've had 20% discounts by agreeing to pay all at once. I then went out and put that on a 0% credit card. The credit card thing is not the best idea, but sometimes there is no other option. Especially when your spouse gets two surgeries for cancer one year, and the next year while still paying on the previous year, you get hit with large hospital and chemo bills. Also, read things over carefully. Insurers love to deny claims, saying it was coded incorrectly, and pass the cost on to you. You can resubmit the claim a special way, telling them to reassess it. I just did this and am being refunding $115. Medical bills are the worst.